This is perhaps the most appealing piece from AmeRRuss Blade Arts to date. 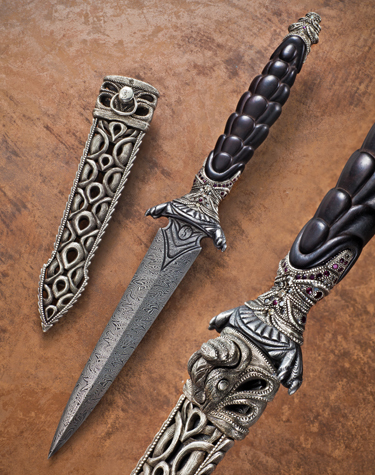 It is a highly embellished dagger with a richly appointed silver scabbard. The double edged blade was forged by J.D. from his “Explosion” pattern Damascus steel of 1084 and 15N20 steels. This highly active Damascus pattern is one of the most visually arresting in any bladesmith’s repertoire. The hilt by Joseph is once again a tour de force of artisanship, with carved African Blackwood and highly detailed silver work and gem settings. The cross guard or “quillons” are carved in the form of clawed feet and add a touch of whimsy to the entire package. Topping off this masterpiece is a scabbard fashioned from sterling silver in an “open work” style. The scabbard is fitted with a locking mechanism that precisely fits to the carved riccasso of the dagger’s blade. The entire package is arrestingly beautiful. Measures: Blade: 6" Handle: 6" Total Length: 12"